Surreal message left outside my office on a hot summer day. 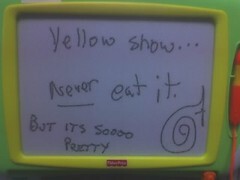 (yes, I use a toy as a message board). Nice! I actually do have pictures of many of the previous messages, none of them left by me. I'll start posting them, just not all at once.